Sept. 29 was Homecoming Saturday night here on campus. Following the very active and tiring day, students, parents, UMPI alumni and some professors joined one another for a great night full of surprises. 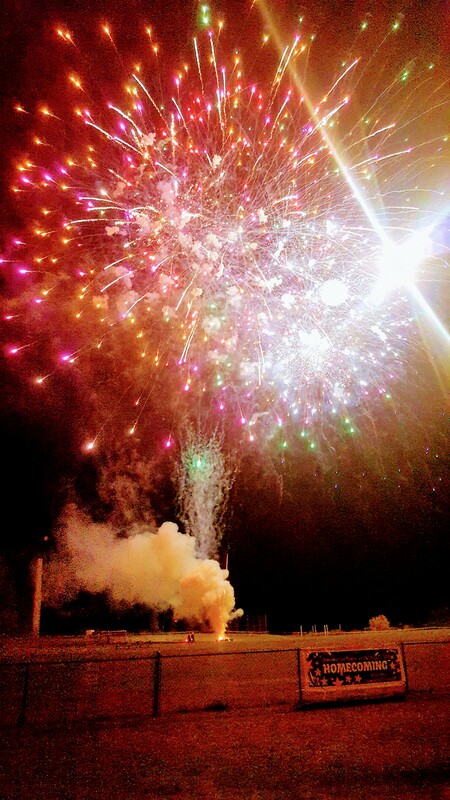 At 8 p.m., everyone gathered at the Park Family soccer field to watch the fireworks, which were more fascinating and magnificent than any past year. “They were very impressive, colorful, suspenseful and very loud. Lots of people showed up and it was a fun night” Mohamud Abukar, a senior who was really impressed with the night and what it had to offer, said. The fireworks this year lasted longer and the show was impressive considering the amount and the quality of the fireworks themselves. “The event was awesome. It was definitely better than last year and my favorite part was the finale,” sophomore Kris Cote, who was also very satisfied with the night, said. Once the fireworks were over, spectators made their way down to Gentile Hall, were the bonfire was held, in order to end their night with some s’mores and chocolate treats in a warm and friendly environment. It seems as if homecoming events here at UMPI never disappoint and they always keep getting better. Let’s all hope that this year starts positively and that it will be as colorful and powerful as these fireworks. Next Next post: October Is Breast Cancer Awareness Month!